Human beings are made up of the rational and the irrational. Irrational has become almost a derogatory label in these sombre times, but we all have parts of ourselves that don’t respond to reason or logic, and that operate according to motives that are largely a mystery. For instance, why do I like watching football? I can talk about whys and hypothesize but the real answer is there’s something within that likes watching footy. I just do. Turn the TV on! From childhood all of us have been cultivating certain qualities, downplaying others. That’s how we grow, it seems. The qualities we cultivate we can usually express easily enough. The ones we suppress are often harder to express; they are the ones most likely to build up deep within. For myself, as an example, “stating needs and desires” comes hard at the best of time. When I’m tired and I want to lie about and do nothing, it’s hard to say this. Often I rush into my chores and never have a whinge about how tired I am. To the rational mind it seems pointless to do so but to an emotion deep in my gut it feels unfair; it needs to express and when that doesn’t happen the tension is stored, awaiting discharge. Then one day that backlog of unexpressed whinges meets a spark of disappointment: perhaps an unexpected expense has destroyed the monthly budget. Now all those fears of neediness come alive and suddenly I’m angry about everything and I can hardly talk at all. My unexpressed whinges have choked up my emotional plumbing. 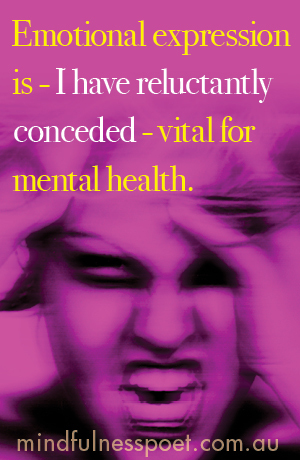 Emotional expression is – I have reluctantly conceded – vital for mental health. It comes down to having a heart that is more open than closed; when we speak from there we can say what we need to, even when it’s hard. And for that to work it needs to be felt, needs emotion, needs the irrational. In the last few years I have been consciously trying to live in harmony with my irrational inner partner, the unconscious. For many years I was an intensely cerebral man who had very little body awareness, and almost no emotional awareness. If I couldn’t understand something it was rejected automatically. As you might imagine, it was a dismal existence. Because the irrational is fundamental to life. Where does spontaneous inspiration come from? Intense feelings? The strength to keep going? Ecstatic delight? They all arise in the places awareness cannot know directly. As humans we need these, so sooner or later we have to trust our irrational shadow partner. 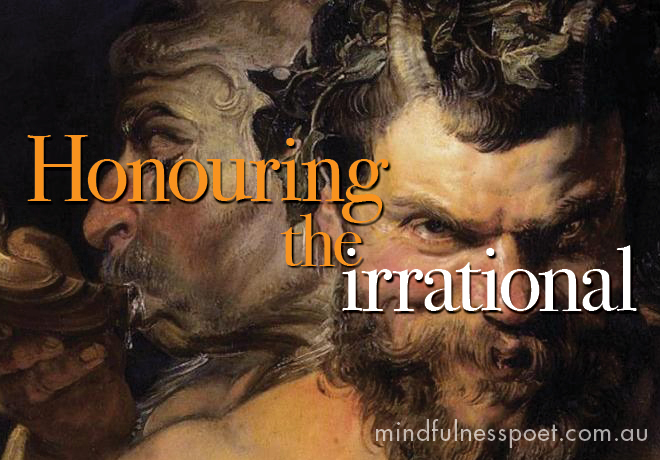 And that means honouring the irrational.